Stimulate a greater interest in increasing the production of livestock among farmers in Louisiana; Serve as a basis for improving breeding practices for livestock; Create interest in producing livestock products as business enterprises; Assist in developing a better spirit of cooperative effort among rural and urban residents; and Provide an opportunity for youth to develop ownership and leadership skills. 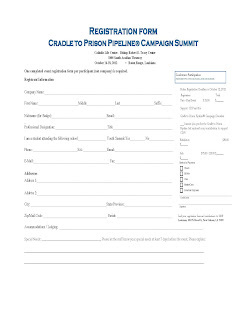 For further information, please contact Christie Monroe at Christie_monroe@suagcenter.com or 225-771-4350. 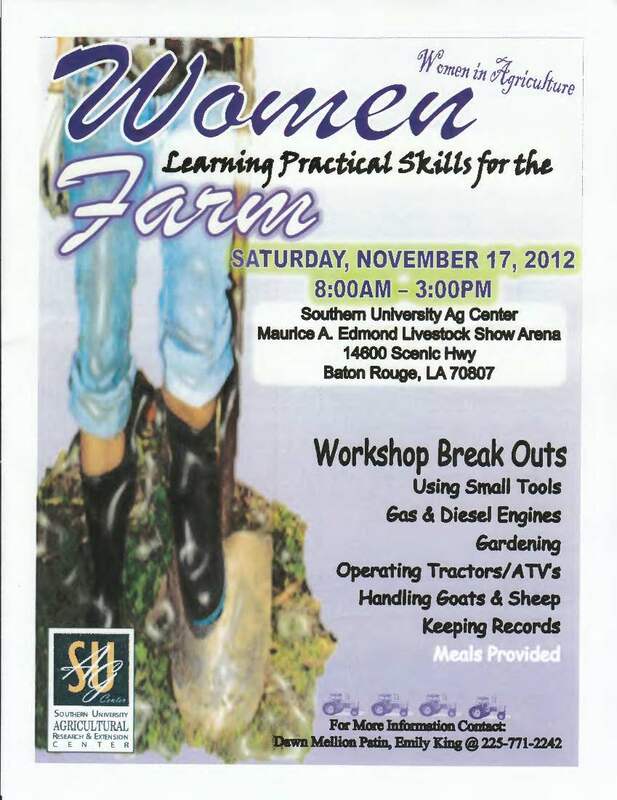 Baton Rouge, LA Southern University Ag Center will hold a workshop on farm skills. 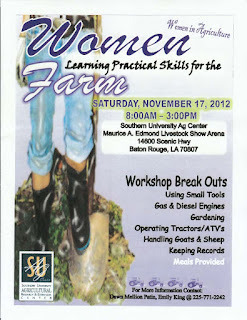 The workshop titled “Women Learning Practical Skills for the Farm” will be held on Saturday, November 17, 2012 at the Maurice Edmond Livestock Arena, 14600 Scenic Hwy, Baton Rouge, LA 70807, from 8:00 am-3:00 pm. Lunch will be provided. 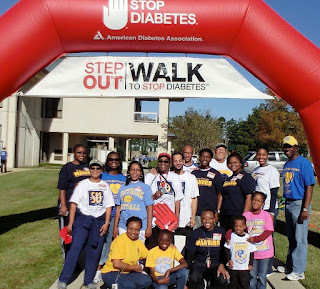 Baton Rouge, La – The Southern University Ag Center participated in the STOP Diabetes Walk October 20, 2012. Team SU Ag Center stepped out onto the streets to help change the diabetes growing epidemic. The goal of the walk is to raise awareness and funds towards preventing and curing this deadly disease. The SU Ag Center team showed up and collected more than $2,600 for the event. All proceeds go to the American Diabetes Association. The walk took place at Pennington Biomedical Research Center. “This is an exceptional year for our team. The support is amazing. By yesterday, we placed third in contribution level. I’m really having a great day,” said Erica William, Team SU Ag Center Leader. The team highly appreciates everyone who showed support, morally, financially, or otherwise. This annual event is organized by the American Diabetes Association whose mission is to prevent and cure diabetes and to improve the lives of all people affected by diabetes. [Baton Rouge, La]. 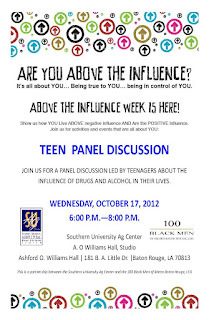 Above the Influence (ATI) week came to a close on Wednesday night at the Southern University Ag Center studio. The three-day “Above the Influence” summit was the result of a partnership between Southern University Ag Center and 100 Black Men of Metro Baton Rouge, Ltd.
On Monday, October 15, ATI participants from Capital High Academy took part in a closed door “Influence discussion” where the teens engaged in an intimate conversation about their thoughts and perspectives on the topic of influence. 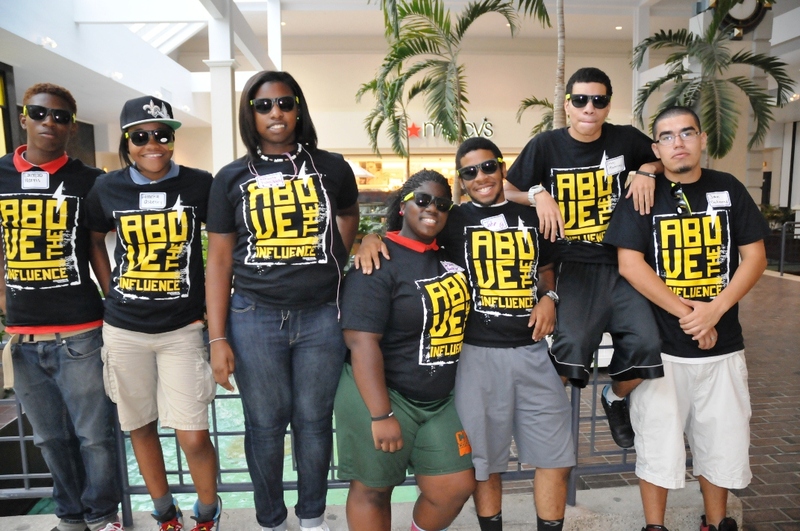 On Tuesday, the ATI participants took part in “Tag it” at Cortana Mall in Baton Rouge, La. “Tag it,” an official ATI activity designed to increase teens’ awareness of influence in their environment and how they may prompt them to make decisions. On the final day of ATI week, an open panel discussion was held on the influences that affect teenagers and how they play a role in their daily lives. The teenagers gave everyone in attendance a glimpse of their personal lives and how they handle positive and negative influences everyday. “It’s okay to be above the influence,” said Lorenzo Harris. “It’s okay to talk to your peers because they’re going through the same thing.” The majority of the teenagers in attendance echoed that same sentiment. “What I learned from ATI is that I’m not the only one going through problems,” said Antonio Davis. Shaquille Dillon, President of the Collegiate 100 Black Men Southern University Chapter, expressed that there is pressure in college as well. “There’s peer pressure in college too, you have to look at it from a broad standpoint,” he said. Because of ATI, the participants said they feel more empowered and better equipped to be young leaders in their communities. “After today I’ll be a great leader because of ATI,” said Keandra Thomas. “The experience has changed me and now I can be better.” ATI has given Capital High Academy students an opportunity to voice their opinions and concerns, about important issues that are often overlooked by adults according to the teenagers. Parents and adults in the audience expressed their concerns as well. “Maybe your parents have that same mentality and want the best for you because they know your full potential, “said Jana Snowden, in response to panelist John Brumfield’s comment about how he is protective of his younger sister and tries to steer her away from the negative influences of being in high school. ATI gave the participants an arena to express themselves openly and freely, without judgment or punishment, something that many of them have never experienced before. The National Above the Influence campaign aims to provide new ways to engage youth in dialogue about both positive and negative influence in their lives and to empower them to make healthy decisions. Charisma Deberry, research associate and Kelli Palmer, graduate research associate coordinated the ATI activities and wrote the story; photo taken by Palmer. Baton Rouge, La - October marks a major achievement in the history of the Southern University System. It was one year ago, October 28, 2011, that the SU System Board of Supervisors approved the proposal for Southern to become the first HBCU college system to achieve the status of 100% tobacco-free campus. This proposal was presented by the Southern University Ag Center where Linda Early Brown serves as the director of the tobacco initiative - Communities of Color Network. Tobacco use is the leading cause of preventable death and disease in the country and some 47,000 African Americans die each year due to its use. 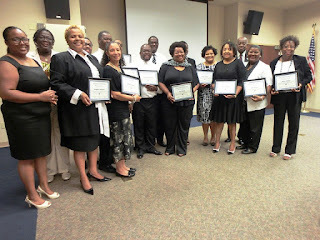 The CoC Network has been educating the African American community, statewide, for a number of years on this issue. It was a logical next step to challenge the University to take the lead in helping to educate the future leaders of this country. Through our ongoing efforts, the CoC Network is committed to providing educational programs that stress the need for a healthy environment. The policy, in general, states that smoking and use of any tobacco products is prohibited in buildings, facilities, dormitories, or any other campus grounds or property owned or leased by the System. Please direct any questions to Linda Early Brown, Director Communities of Color Network-SU Ag Center at 225-771-4456. 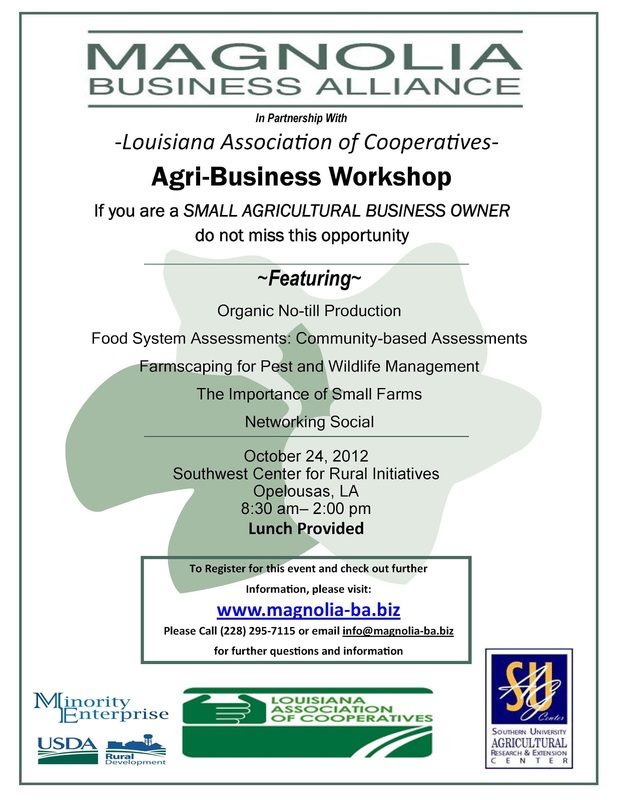 Baton Rouge, La - The Louisiana Association of Cooperatives in partnership with Magnolia Business Alliance will hold a workshop for small agricultural business owners. The workshop will be held at the Southwest Center for Rural Initiatives, Opelousas, LA, 8:30 am-2:00 pm, October 24, 2012. The Southwest Center operates as a satellite entity of the Southern University Ag Center. The workshop will Feature: Organic No-till Production; Food System Assessments: Community-based Assessments; Farmscaping for Pest and Wildlife Management; The Importance of Small Farms; Networking Social, and lunch will be provided. The Louisiana Association of Cooperatives is committed to "Serving Our State, Acre by Acre"
Rev. Donald Hunter, Evaluation & Dev. Services, Inc. 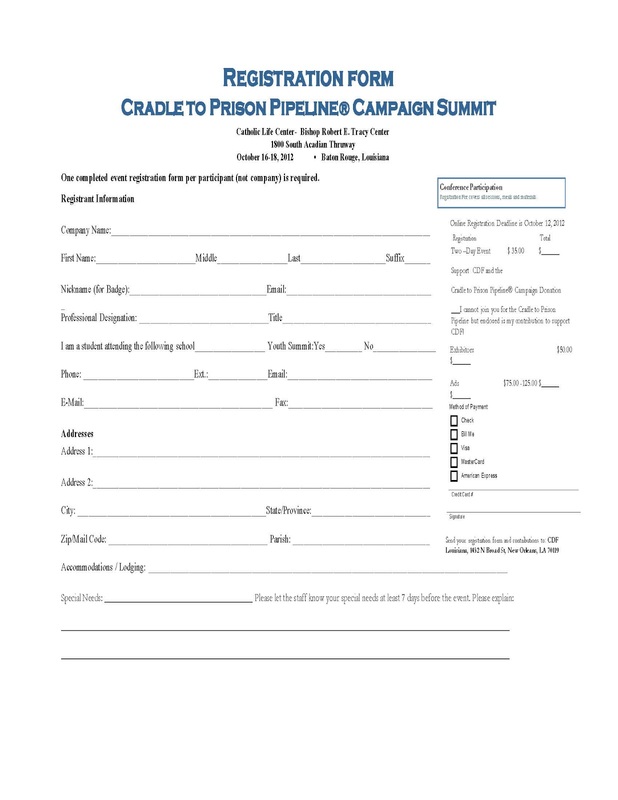 The Annual Cradle to Prison Pipeline® Campaign Summit for leading child advocates, clergy leaders, youth activists, social workers, parents and the community at large will be held on Tuesday, October 16-17 at the Catholic Life Center in Baton Rouge, Louisiana. 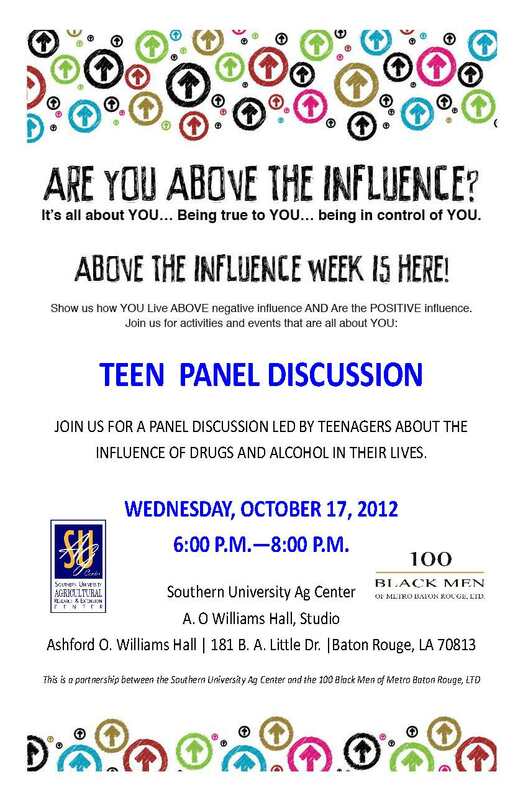 Baton Rouge, La – The SU Ag Center will host a panel discussion led by teenagers about the influence of drugs and alcohol in their lives on Wednesday, October 17, 2012, from 6:00 pm-8:00 pm. This event is a partnership between the Southern University Ag Center and the 100 Black Men of Metro Baton Rouge, LTD.
Baton Rouge, La - The Southern University Ag Center had a successful 4-H National Youth Science Day on October 10. The youth excited about their hard work and accomplishment at the EcoBot challenge event. Community members were on hand to lend moral support to the future scientists, including East Baton Rouge Mayor Melvin “Kip” Holden, who took time out of his busy schedule to support our youth. “I was once a 4-Her, and this area is dear to me.” said Holden. He encouraged the students to make the best use of their academic exposure. “Take the opportunities given to you, keep the faith, accept the challenges and stay the course.” He also mentioned that we have oil spills in Louisiana quite a bit. 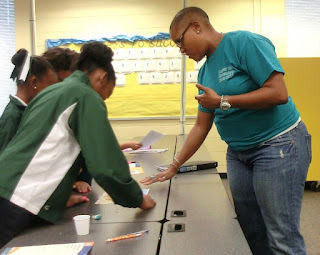 The theme for 4-H National Youth Science Day Program at the SU Ag Center was “Youth Becoming Positive Leaders and Protecting their Environments.” This theme was appropriate for the EcoBot activity, in which participants from the Southern University Lab School 6th grade class undertook the task of building a robot to clean up a simulated oil spill. Baton Rouge, La – Southern University Ag Center hosted 13 senior citizens from East Baton Rouge Council on Aging, H.B. Williams Tower of Strength Outreach Center of New Light Missionary Baptist Church located on Blount Road. The group expressed an interest in starting a community garden and Dr. Fatemeh Malekian, nutrition professor, extended an invitation to them. During their visit to the Ag Center, Ryan Nicholas, urban forestry doctoral student, was on hand to make a presentation on hibiscus from field to value added products. Malekian provided refreshment including hibiscus tea, chutney, as well as teabags to take home. Dr. Kit Chin, hibiscus research project director, discussed the many health benefits of hibiscus to the group. The visitors were excited about what they heard about this specialty crop and the SU Ag Center is poised to assist them with their gardening needs. Mrs. Angela Jackson, administrative assistant led the tour group. 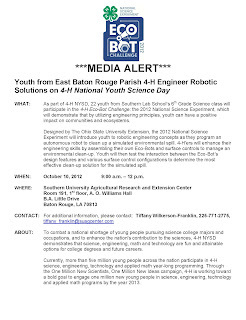 Baton Rouge, La - The Southern University Ag Center is requesting your presence at our first 4-H National Youth Science Day! Our youth are excited about the EcoBot challenge event and we would like for you to show them your support. See you tomorrow! 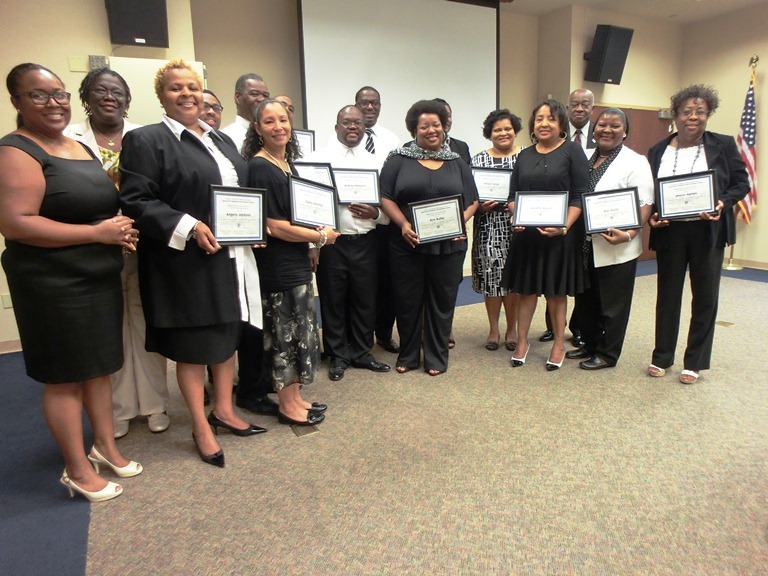 Baton Rouge, La – The Building Opportunities through Leadership Development (BOLD) at Southern University Agricultural Research and Extension Center graduated 15 participants from a two-year leadership training on Saturday October 6, 2012. Participants hail from diverse parishes and backgrounds. Baton Rouge, La - Southern University Agricultural Research and Extension Center enjoyed hosting three representatives from The Nation of Islam on October 4, 2012. The meeting followed the highly anticipated appearance made by the Honorable Louis Farrakhan in the Southern University mini dome the previous night. The team visited the Ag Center to discuss the important role education and agriculture plays in our future. Nation of Islam Representatives in attendance: Larry Muhammad, Ph.D., Dean of Muhammad University of Islam; Rashidah Muhammad, Baton Rouge Representative, Deborah Muhammad, Southern University Student Representative. The purpose of the meeting was to discuss building a partnership to increase the student enrollment in agriculture related majors. Both parties agreed there is a lack of awareness in America about the significance of agriculture related research and extension programs. Dr. Larry Muhammad stated that Muhammad University of Islam is focusing its efforts to increase African American teenagers’ involvement in agriculture. SU Ag Center leadership emphasized the importance of community gardens in order to expose urban areas to healthy food sources. Dr. Dawn Mellion-Patin, agriculture specialist, explained how community garden concepts help instill “leadership and responsibility” in the youth. SU Ag Center officials look forward to building a relationship with The Nation of Islam to increase awareness about agriculture related issues. Story written by Charisma Deberry, charisma_deberry@suagcenter.com; photo by Chris Rogers. 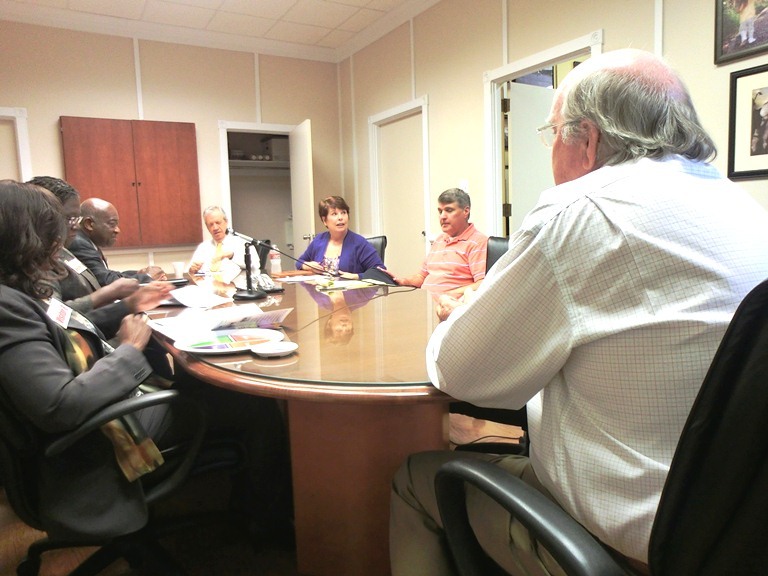 Baton Rouge, La – Monroe News-Star says: “Effects of Southern Ag Center programs seen in everyday life,” following editorial board meeting on October 3. Attending the meeting from Southern University Ag Center were: Leodrey Williams, chancellor; Gina E. Eubanks, vice chancellor for Extension; Odis Hill, agent; Sarah Sims, agent; Carolyn Robinson, agent; Charisma Deberry, research associate and Bridget Udoh, Communications Specialist. Extension agents came from Madison, Union, Morehouse, East and West Carroll Parishes to share how their programs impact lives of local citizens in north Louisiana. 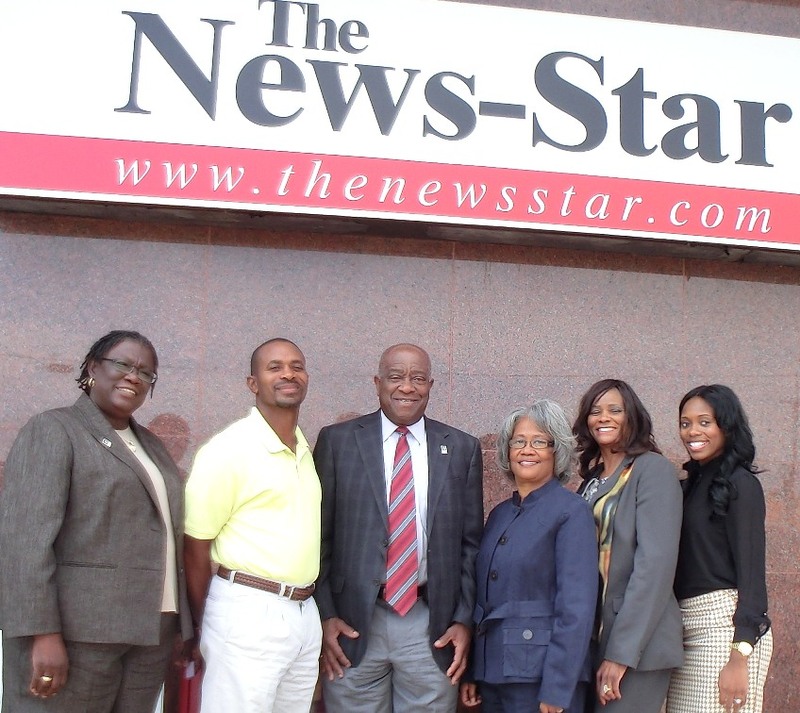 Baton Rouge, La – Southern University Agricultural Research and Extension Center Chancellor Leodrey Williams and Vice Chancellor for Extension Gina E. Eubanks paid a courtesy visit to the Monroe-based News-Star editorial board on Wednesday Oct. 3, 2012. Board members in attendance were: Kathy Spurlock, Executive Editor; David Petty, Publisher; Greg Hilburn, Staff Writer; Tom Nicholson, Community Representative; and Lyle Miller, Community Representative. Kathy Spurlock, who opened the meeting with greetings and introductions stated that “this was the first we have anyone visit from the Southern University Agricultural Center,” and that she was not aware the Center had any agents in the area. 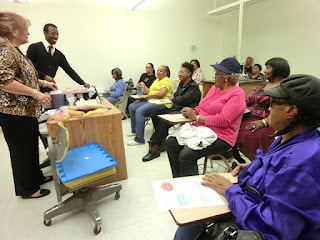 Extension agents in the surrounding parishes were also in attendance to share their program activities with the newspaper board and to make their presence known. Agents present to share their program impacts were: Sarah Sims, Madison parish; Odis Hill, Union and Morehouse Parishes; and Carolyn Robinson, East and West Carroll Parishes. Adell Brown, Jr., Vice Chancellor for Research coordinated the meeting with Ms. Spurlock. 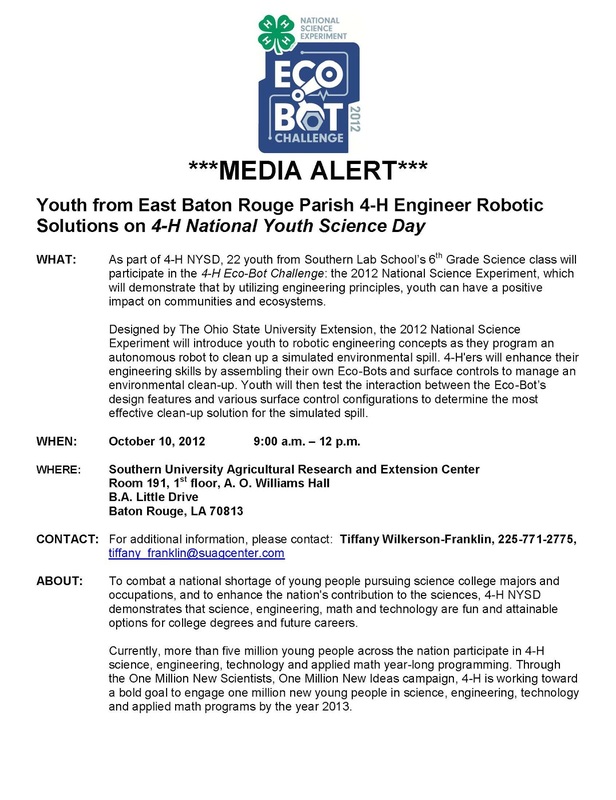 Baton Rouge, La - The Southern University Ag Center is requesting your presence at our first 4-H National Youth Science Day on October 10! Our youth are ready for this year’s EcoBot challenge event and would like your support. Read the Advocate article for a snippet of the show case on October 10th. [Baton Rouge, La, October 1, 2012] The Southern University Ag Center, along with the 100 Black Men of Metro Baton Rouge, have partnered with “Above the Influence” for their national media campaign. Above the Influence was created for the National Youth Anti-Drug Media Campaign and focuses on teens and the influences that shape their decisions. The program inspires teens to live above the influence of drug and alcohol. The first school to participate in the event is Capital High Academy. Members of the Southern University Ag Center visited the school on September 28 to see their progress with the Above the Influence national campaign. “Louisiana teens are facing alcohol and drug addictions at alarming rates. Above the Influence targets teens in their most vulnerable state and allows them to identify negative influences of drug and alcohol addiction,” says Charisma Deberry of the SU Ag Center. Students from Capital High Academy will participate in a three-day summit at the SU Ag Center’s A.O. Williams Hall on October 15-17th. The summit concludes on October 17 with a panel discussion from 6 pm to 8 pm; the public is strongly encouraged attend. For more information about Above the Influence, contact Charisma Deberry at charisma_deberry@suagcenter.com or Kelli Palmer at kelli_palmer@suagcenter.com or 225-771-5696. About Above the Influence: Above the Influence (ATI) is a national campaign created and implemented by the National Youth Anti-Drug Media Campaign, a program of the Office of National Drug Control Policy. ATI informs and inspires teens to reject illicit drugs via TV, print, Internet, and local radio advertising – and, most importantly, in partnership with community organizations.